Wir betreuen Sportler ab dem Juniorenalter in den Bereichen Fitness, Techniktraining (speziell Fussball und Laufsportarten), Mentaltraining / Sportpsychologie (Swiss Olympic anerkannt) und Sporternährung. Wir bieten Einzel- oder Gruppentrainings an und für Vereine oder Mannschaften, so wie auch Workshops vor Ort. Unser monatlicher Kursplan ist auf unserer Webseite www.sportpec.com aufgeschaltet, so wie auch die Informationen über unsere aktuellen online Kurse. Bei SPORTPEC braucht ihr nicht zwingend ein Abo, man darf auch einfach spontan an Gruppenklassen teilnehmen (mit kurzer Anmeldung). Unsere Abos haben kein Ablaufdatum und man kann damit alle Kurse im Angebot besuchen. Gerne stellen wir auch Geschenkgutscheine aus. Über Personal Training, individuelle Trainingspläne, Ernährungscoaching oder Mentaltraining geben wir gerne via e-mail (info@sportpec.com) oder Telefon (056 430 04 08 oder 079 307 14 53) Auskunft. Für Firmen die etwas für die Gesundheit ihrer Mitarbeiter tun wollen, bieten wir Themenworkshops in verschiedenen Bereichen an: Mentaltraining, Team Building, Auswertung von Stärken und Schwächen, Fitness, Ernährung und vieles mehr. Auch Lunch-Break-Fitness-Trainings, Online-Fitness-Challenges und diverse Online-Kurse gehören zu unserem Kernangebot. Gerne stellen wir etwas zusammen oder geben weitere Auskünfte. In den 3 Grundbereichen Ernährung, Bewegung & Fitness und Mentale Fähigkeiten bieten wir entweder praktische Workshops/Trainings vor Ort an oder Online-Module. Wir legen Wert auf persönliche Verbesserung und eine effiziente Integration der Module in den Tagesablauf: auch die Fitness-Challenge-Trainingseinheiten können zu Hause absolviert werden und es braucht keinerlei Hilfsmittel. Why do some athletes make it to the top and what helped them get there? SPORTPEC is a Sport Performance Enhancement Centre that offers a variety of services to better athletic performance. As sport is becoming more and more competitive we feel that performance should be approached from a holistic level and all areas such as sports medicine, strength and fitness, nutrition and mental skills should be worked on to reach maximum potential. We are a team of Sport Psychologists and former professional athletes and offer a variety of services to better athletic performance. As sport is becoming more and more competitive we feel that performance should be approached from a holistic level and all areas such as sports medicine, strength and fitness, nutrition and mental skills should be worked on to reach maximum potential. As athletes are very busy and travel a lot we have created a program that is accessible from anywhere, allows the athlete to work at his or her own pace and still get professional feedback to ensure progress. Our services include Sport Psychology, Sport Counseling, Mental Skills Training, Mental Skills Assessments, Coaching Skills Workshops, Specialized High Performance Programmes, Special Event Workshops, Team Building / Team Dynamics, Olympic Value Education Programm and our feature Online Program (including mental skills, topic and sport specific modules). We also tailor make programs for individual athletes, teams, clubs, schools or federations which are customized to age, level and situation. The online Sport Psychology / Mental Skills program is based on the concept used by US Olympics and works in module form. Every module has 3 parts: a power point presentation which gives a visual overview on the topic, a workbook which explains the theory and worksheets that can be filled in for practical application. An athlete who purchases a module gets sent the module pack and works through it at his or her own pace and time. Once completed he or she sends the worksheets back to us and will get a personal feedback report back with recommendations regarding his or her personal performance. That is the real value of the module, that an athlete gets to ask questions, apply the material specifically to his own situation and gets feedback while not having to go anywhere and being able to work through the material at his own pace. Anybody who would like to improve their overall athletic performance can benefit from the Sportpec program and there are no age restrictions but we do recommend that junior athletes are at least 13 years old when they do the online program. 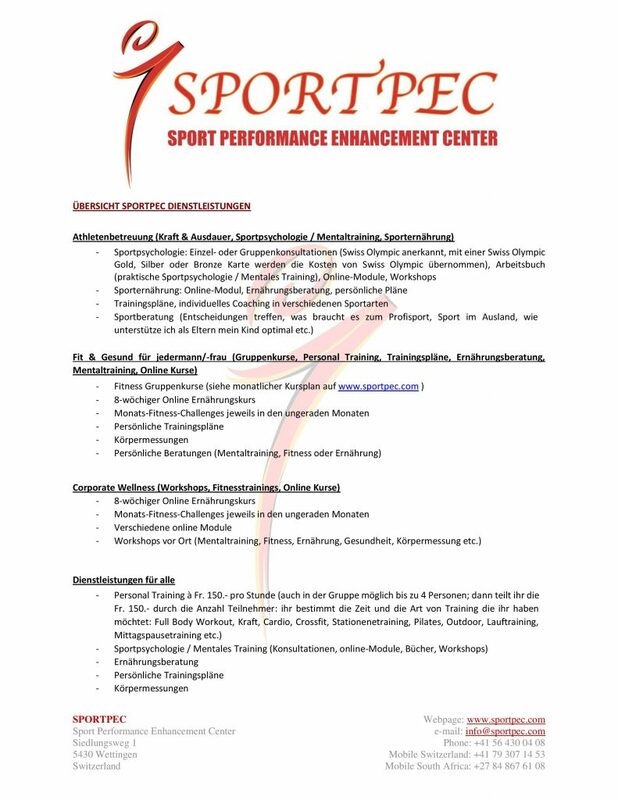 Sportpec’s main offices are in Switzerland (Swiss Olympic accredited) and we also run programs in South Africa. Individual athletes, teams and clubs across Europe, South Africa and the USA are using our program and you can gladly contact us for more information or customised services.